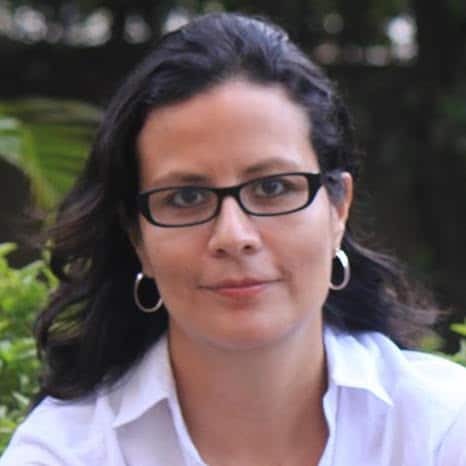 Eliana Villota has 13 years’ experience in the private sector, leading processes of designing and assembling sustainability models in the biotechnology industry, coordinating with allies for inclusive businesses, and serving as a production, logistics and marketing engineer. In 2012, she co-founded Minka-Dev with Juliana Mutis, and she currently serves as the company’s Latin America director. Minka-Dev develops and implements businesses with social and environmental impact, based on the power of collective action and the generation of networks. With the team at Minka-Dev, she has developed and implemented businesses with social and environmental impact in areas including food security, the sustainable use of “corozo de lata” palm and mangrove swamps, the linking of biodiversity with gourmet gastronomy, eco-efficient stoves, the potential of bitter palm in vernacular architecture, and inclusive recycling, with organizations such as the Alliance of Social Innovation Pioneers, promoted by Colombia’s Department of Social Prosperity (DPS), the Fund for Biodiversity and Protected Areas (Patrimonio Natural), the German Cooperation Agency (GIZ), the Catalan Agency for Development Cooperation, Bonafont, and Pronatura Sur, in Colombia, Peru, and Mexico. Eliana studied Chemical Engineering with a concentration in Environmental Engineering, and is a specialist in Global Business and Marketing. She is interested in applying collaborative and innovative tools and methods in a business context: participative leadership (Art of Hosting), Dragon Dreaming, Design Thinking, Open Innovation, and Theory U. She currently lives in Bogotá, Colombia. After over 50 years of internal armed conflict between the national government and the Revolutionary Armed Forces of Colombia, the country is starting to lay the foundations for a stable and lasting peace. The business sector has been called on to contribute to the post-conflict process, and inclusive businesses offer a clear way to do so. However, though Colombia's traditional approach to inclusive business has produced significant results for enterprises and communities, the impending post-conflict era demands a re-evaluation of how the sector operates.